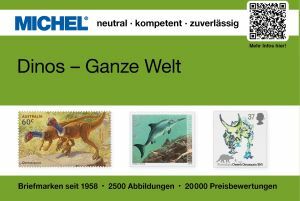 Here you can see almost 870 images of clean and postal used FDC with official and local stamps depicted dinosaurs and other prehistoric animals, prehistoric plants, fossils, paleontologists and paleoanthropoligists, natural history museums as well as some ccontributors to Paleontology and Paleoanthroplogy science, Charles Darwin for example. Term: FDC cover is a cover with post stamp canceled by either commemorative, specially designed, pictorial, or regular postmark with date of official stamp release, indicating the city and date where the item was first issued. Depending on the policy of the nation issuing the stamp, official firs tday postmarks may sometimes be applied to covers weeks or months after the date indicated.Most Post Authoriry around the world designs cover with similar design of the stamps, other uses regular covers fro FDC purpose. Most of the covers shown on this page are from collection of Admin of this site, some others are shared by friends of visitor of this site, few others are downloaded from internet. If you have any FDC not listed here, please share it scan with Admin of this site (600 dpi are preffered). Many thanks to fellow collectors Jon Noad from Canada, Peter Brandhuber from Germany, Ivan Nazimov from Russia who shared many scans of FDC from their collections with me. Click on the image to enlarge it. Undesired/"Pseudo stamps" are on grey background, when good one are on the black.